Physician-scientists Michel Sadelain and Jedd Wolchok have been appointed to a new research team dedicated to investigating ways to harness the immune system to fight cancer. 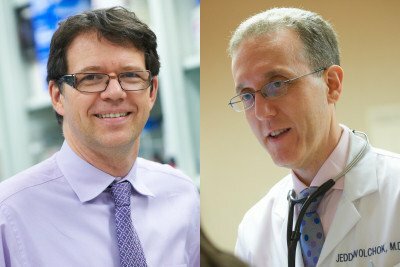 Michel Sadelain, Director of the Center for Cell Engineering, and Jedd Wolchok, Director of Immunotherapy Trial Development and Monitoring for Memorial Sloan Kettering’s Ludwig Center for Cancer Immunotherapy, have been appointed to a new Stand Up To Cancer (SU2C) “Dream Team” dedicated to immunotherapy research. Immunotherapy treatments harness the body’s own immune system to attack cancer. The Immunology Dream Team will pursue two research techniques. The first, being led by Dr. Wolchok, involves studying how a type of white blood cell called a T lymphocyte, or T cell, can kill cancer cells. Sometimes, the natural function of the T lymphocyte is blocked or not activated enough to attack cancer cells, allowing the cancer to grow. Part of the Dream Team’s focus will be to investigate ways to ensure that the T lymphocytes work properly in recognizing and killing cancer cells. Another immunotherapy approach known as adoptive cell transfer (ACT) involves removing some of a patient’s T cells, enhancing their cancer-fighting abilities and growing them in the laboratory, and then infusing the enhanced cells back into the patient. This can provide a patient with an army of immune cells specifically programmed to fight against cancer. This part of the Dream Team’s research, led by Dr. Sadelain, will investigate several ways to use ACT as a cancer therapy. The new Dream Team is being funded jointly by SU2C, a nonprofit program that raises funds to accelerate the pace of translational research, and the Cancer Research Institute (CRI), a nonprofit that provides funding for cancer immunology research at every stage of discovery. The joint project, known as “Immunologic Checkpoint Blockade and Adoptive Cell Transfer in Cancer Therapy,” provides up to $10 million during a three-year period. SU2C has awarded grants to a total of nine Dream Teams, which all together comprise more than 450 scientists at 87 institutions. Memorial Sloan Kettering’s Charles Sawyers, Chair of the Human Oncology and Pathogenesis Program, and President and CEO Craig Thompson are co-leaders on two other Dream Teams. I am interested in Epidemiology and new development on treatment of Cancer like with Sallvestrol and antioxidants. But I am living in Reisterstown, Maryland. I will be grateful if you could advise me similar Cancer institutions in this area. Many thanks. Mohammad Ali Barzegar,MD,MPH. You can find a list of National Cancer Institute-designated comprehensive cancer centers here: http://www.cancer.gov/researchandfunding/extramural/cancercenters/find-…. Thank you for your comment! This treatment makes more sense then any other treatment I have heard of. Speaking from someone who has been through chemo, radiation and surgery because of this terrible disease. My family of 5 is down to a family of three with my Dad and brother dying from cancer. Now my Mom and I have both been going through treatments. I hope this is the miracle we have all been praying for! Recently saw something on the news about using the HIV virus to treat cancer. Is this approach similar? We spoke with Dr. Sadelain, and he said that the project mentioned in this post will similarly make use of targeted T cells that are engineered to express a specific receptor (but a different one, recognizing mesothelin). The New York Times story was about therapy for pediatric leukemias, while the research in this grant will study therapies for mesothelioma, non-small cell lung cancer, and breast cancer. I am a Synovial sarcoma surviver, I've had 2 recurrances in my left lung would this help me in the future? It is too soon to know whether this work will be beneficial for particular patients. Thank you for your comment! How about squamous cell (head/neck) cancer? Any new therapies for this down the pike? You can learn more about clinical trials we are offering for patients with head and neck cancers here: http://www.mskcc.org/cancer-care/adult/head-neck/clinical-trials. I am a triple negative breast cancer metasis to bone patient. Would I be a good candidate for this? I really hopeful and am excited for this. If the enviornment that I have been living in,added or promoted the cancer cell to react, then I must change my enviornment, so to change the way my body reacts and can adjust . A more positive and less stress life is what I feel I need to live. Stress on the body increases inflammation, this is key to winning this war that is going on in the body, fighting inflammation and winning ! We all know a positive life style plus living a proactive life puts the enemy on the run. The greatest gift God has given us is the mind, and using the mind to heal the body with sleep makes for a stronger body. Thinking outside of the box is where we need to go to get the answers we are all looking for. I would open to researching more of our indoor enviornment so to support Life. Very interesting. My father Giacchino Failla was an early pioneer at Memorial Hospital. I have non-small cell lung cancer that was diagnosed 2 years ago as stage 4. However it has not grown but a tiny bit without treatment as I am very strong and am enjoying my quality of life. I might be a good person with whom you could experiment. I am not asking for help. I am offering to maybe help you. If you are interested in finding out more about our clinical trials, please visit http://www.mskcc.org/cancer-care/clinical-trials/clinical-trial or call 800-525-2225. Thanks for your comment! Are you aware of any work being done in the immunology area in Portland, Oregon? We have one top research center, the Knight Cancer Center at Oregon Health and Sciences Institute where they developed Gleevec. I'd be interested to know as I am a survivor of breast cancer with a high oncotype. Soy sobreviviente de cancer de pulmon en Memorial Aloan-Kettering el año 2005 me operaron y sacaron todo el pulmon izquierdo, despues de haber pasado un tiempo muy dificil durante empece una alimentacion balanceada, ahora me doy cuenta que los descubrimientos cientificos de los medicos de este hospital son excelentes ya que centre mi alimentacion en todo lo que ayuda al sistema inmunologico y ahora despues de siete años me siento mucho mejor. KEEP UP THE MIRACULOUS WORK. It is too soon to know whether this work will be beneficial for particular patients. If you are interested in finding out more about our clinical trials, please visit http://www.mskcc.org/cancer-care/clinical-trials/clinical-trial or call 800-525-2225. Thanks for your comment! Hi Amy, you can learn more about our various education and training programs here: http://www.mskcc.org/education Thank you for your comment! Is the trial being developed by The Dream Team ready yet to include patients that meet the criteria who have been diagnosed with non small cell lung cancer, specifically Adenocarcinoma possibly stage 4? What exactly is the criteria? Sandy, It is too soon to know whether this work will be beneficial for particular patients. If you are interested in finding out more about our clinical trials for non small cell lung cancer, please visit http://www.mskcc.org/cancer-care/clinical-trials/clinical-trial or call 800-525-2225. Thank you for your comment. I have stage IV papillary thyroid cancer. Is t-cell immunotherapy or engineering available for this kind of cancer at your hospital? If you’d like to speak to someone about coming for treatment at MSK, you can call 800-525-2225 or go to http://www.mskcc.org/cancer-care/appointment for more information. Thank you for your comment. I would like to find out about the t cell immunotherapy trial. i understand that new trials are starting in early 2015 by the dream team. Is there anything I can read on your website. J, to stay up to date with the latest in immunotherapy research at MSK, we recommend you check back often to the immunity science section of our website. You can find it here: http://www.mskcc.org/research/immunity-science-msk Thank you for your comment and for your interest in our research.